It is interesting to note that NASA 2017 agrees quite well with NCAR 74 for the period 1908 to around 1940. Given that why does NASA 2017 so greatly disagree with NCAR 74 for the period after 1940? NASA needs to explain what happened to thermometer/temperature readings after 1940 that has resulted in such a massive divergence. It would appear that people in the past, during the period 1908 to 1940, were sufficiently capable of taking and recording temperature details, but suddenly post 1940 people could no longer reliably perform that task. Why is that? If this was genuinely a science, there would be detailed papers on the divergence and why the divergence had occurred. Green party spoiler votes (and loss of home state Tennessee) are blamed for Al Gore not winning the Y2k election. When that happens, parties change their platforms, and pet parasites alter data to regain government paychecks, grants, handouts and graft. The Bryanist income tax proposed 1892, debated 1893 and passed 1894 was a plank no major party endorsed. But the more fanatical looters got 9% of the 1892 ballot count. I have just posted a comment that is in moderation. In error i entered my email address twice. Please correct and substitute my name (richard verney) rather than posting my email address. The same column reports William Jennings Bryan demanding nationalization of all railroads, commie assassinations, revolts and mutinies in Russia and Poland. The biggest change is that none of the murderers are Saracens for Allah. Tony, I thought that NASA, in addition to warming the present cooled the past quite a bit too – to create the hockey stick they want. But this particular comparison does not show a cooled past in the 20’s – 40’s, as in other comparisons you’ve presented. Can you explain the differences between this graph and the others ? Thank you. The two graphs are normalized from 1880 to 1940. The absolute temperatures don’t mean anything. It appears our climate is temperature-fluid. Our government is just showing that it is with the times, and understands diversity in all things, except thought. The government uses here the same tricks it uses with unemployment statistics. in a country with 330 mio people and 102 mio working age americans without a job the official unemployment rate is 4.4%. than people have been so dumbed down that you surely have no problems to believe that earth will become a fireball even when the equator is full of icebergs. Do you know when I Google search for “Steve Goddard” I have to wade through all these sites and articles talking about what a lying sack of bovine excrement you are and how your latest blah blah has been shot full of holes? Apparently, you have been discredited long ago for egregious lies, cherry picking, and the like. Plus all these sites like the desmog zone that have biographical blurbs detailing your manifold sins against science and humanity. One of these sites had the Steve Goddard falsehood matrix. On the left, what you said. On the right, what the experts said. Of course what the experts said is always some generic BS blurb like “Warming is happening, it is catastrophic, and we are close to the tipping point”. In fact most of the supposed hammering you get over all that lying and cherry picking boils down to “warming is happening, it is catastrophic, and we are close to the tipping point”. That or some drawn out rigmarole that essential boils down to “trust us, we have real scientists”. Funny how that works in the world of Google (Goggle?) isn’t it? Mark Twain once said (paraphrased) when you throw a rock at a bunch of dogs you can always tell if you hit one. Can you show both plots to 2017? Is the X axis for NASA outside the chart boundaries and compressed from 1970 to 2016? How would I show a 1974 graph to 2017? That would be meaningless and completely off-topic. The point of this post is to show how the 1940 to 1970 data has changed. Isn’t the point that NCAR showed the temperature anomaly from 1940 through to 1970 dropping from +0.5 degC to + 0.1 degC, whereas, NASA 2017 shows that there was no temperature anomaly drop, during the 1940 to 1970 period. There was some short lived variability around the +0.5 degC anomaly level. NASA has effectively warmed this period by up to +0.4 degC, and has altered a fall in temperatures to zero trend. OK, I get that, but which is correct? Why is the NCAR data “correct” and NASA not? What is the “NASA 2017” plot outside the right hand side of the chart. What do they represent time period – wise. Does it represent 1980? Where can I download this data, so I can do 1870-2016, thanks in advance. Because the NCAR scientists were making observations in 1970, whereas the current NASA fake scientists were in diapers. So, which is correct? Forget about diapers, which one is right? What about current data NCAR Vs. NASA.? If you are saying NCAR is “right”, then how do the two sets of data compare today in 2017. 1970 is past. I’m trying to agree with you, but you need to expand. 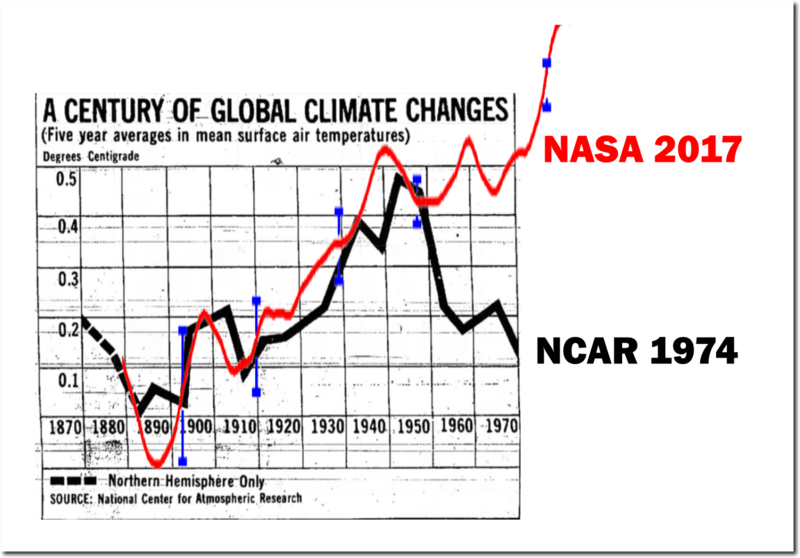 Today’s NASA took the same measurements that NCAR used in their 1974 graph. 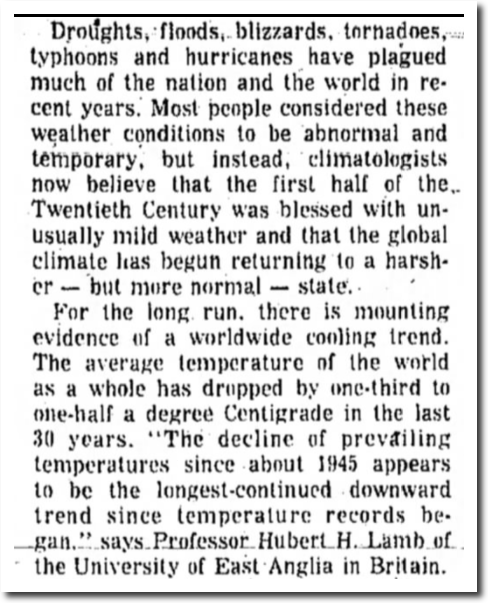 NASA redrew the past, further cooled the 1890s, suppressed the measured cooling of the 1960-1970s period and created a century of steady temperature rise. So which is correct? ? The graph doesn’t say that at all. 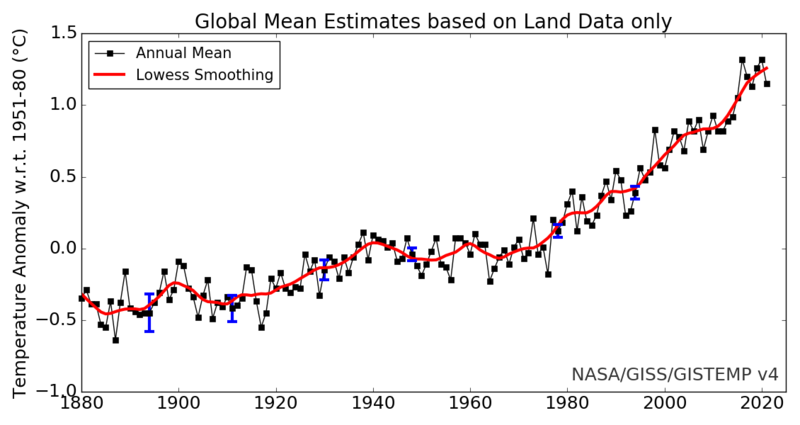 They both fall within the error bounds of the 2017 NASA data on the graph from 1870-1950.